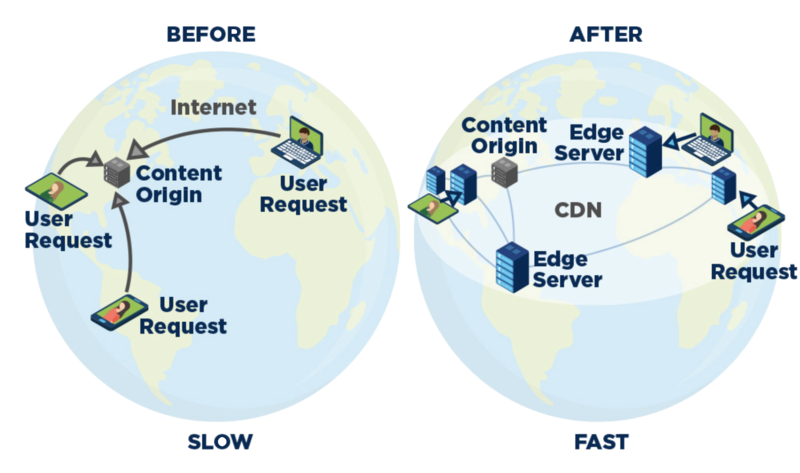 So, to dramatically reduce page runtime, improve performance, and reduce infrastructure and bandwidth costs, you can easily implement a Content Delivery Network (CDN) to cache these resources over a set of servers that are geographically distributed across Canada. A Content Delivery Network is a set of geographically distributed servers that deliver consistent content to end users. This static content can be almost any type of data, but CDN networks are often used to connect web pages and associated files, video and audio broadcasts, and large software packages. This allows geographically distributed users to reduce the number of hops required to receive static content by accessing content directly from the adjacent edge cache. The result is far less latency, faster loading times for pages, and a significantly lower load on the source infrastructure. 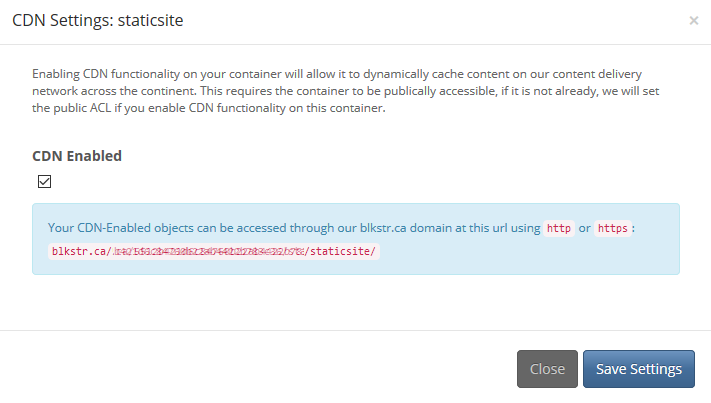 How does the Bulk Storage CDN (blkstr.ca) work? Almost any site may benefit from leveraging a CDN, but the main reason for implementation is usually to load the bandwidth of the original servers on CDN servers and reduce the waiting time for distributed users geographically. Here are the top 5 most compelling reasons our clients tell us CDN is critical to how they deploy their Apps in the cloud. If your user base is geographically dispersed and a non-trivial part of the traffic is from an external geographic area, a CDN can reduce latency by caching static assets on edge servers closer to your users. By reducing the distance between users and static content, you can deliver content faster to users and enhance your experience by increasing page load speed. For websites serving video content for example, where high latencies and slow loading times more directly impact user experience, these benefits are compounded. CDNs enable you to handle very high traffic spikes and allow burst traffic via load balancing requests on a large distributed network of edge servers. By loading and caching static content on a distribution network, you can accommodate multiple concurrent users with your existing infrastructure. For sites that use a single origin server, these large traffic spikes can often overwhelm the system, resulting in downtime and unplanned downtime. Transferring traffic to a highly accessible and redundant CDN infrastructure designed to handle varying levels of web traffic can increase the availability of your assets and content. Because managing static content usually accounts for most of the bandwidth usage, you may reduce your monthly infrastructure costs by loading these assets over a content delivery network. In addition to reducing bandwidth costs, a CDN can reduce server costs by reducing the burden on the original servers so that your existing infrastructure can evolve. We offer usage based billing at competitive prices @ $0.05 CAD per GB of data transfer with no usage commitments or minimums. Traffic between Bulk Storage and the CDN nodes for your files is not charged for, you only pay for public egress traffic. Another common use case for CDNs is DDoS attack mitigation. By leveraging a CDN you reduce the total attack vectors on your application. Our CDN service for Bulk Storage analyzes traffic across the continent for suspicious patterns, blocking malicious attack traffic while continuing to allow reputable user traffic through. A content delivery network can be a fast and effective way to improve the scalability and availability of your sites. By caching static assets on a geographically distributed network of optimized servers, you can dramatically reduce page load times and end-user latencies. In addition, CDNs allow you to dramatically reduce bandwidth consumption by absorbing user requests and responding from the edge buffer, reducing bandwidth and infrastructure costs. With libraries that can enable support for third major frameworks like WordPress, Drupal, Django and Ruby on Rails, as well as additional features such as SSL/TLS, support for resource compression, and avoiding DoS attacks, CDNs can be a powerful tool for optimizing high traffic websites.